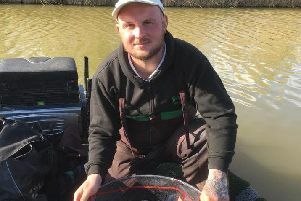 The Saturday qualifier for the £1,000 Open final at Rookery Waters was fished on the Magpie Pool and saw Whittlesey ace and venue regular Simon Godfrey take the honours. He made the most of the empty peg to his left by using casters and dead maggots long up to the next platform for 167lb 4oz. Runner-up was March rod Barry Mason on peg 38. He had a slow start before catching late on big baits over micros in his margins, finishing on 135lb 2oz. Third was Tony Dawson with 134lb. In the popular Wednesday Over 60s match on the Magpie Pool first place went to Roy Whincup with 168lb 2oz from peg eight. Then came Chris Saunders with 166lb 14oz and Dave Lack with 143lb. The Thursday £1,000 qualifier was fished on the Raven Lake and top rod was Simon Easy on peg two. He fished corn and pellet for 71lb 4oz. Runner-up was Graham Welton from peg 25 with 62lb, then came Tim Bates on 57lb 8oz. Fenland Rods fished the Magpie Pool on Sunday when top spot went to Tony Nesbitt on peg 11. He caught on the pole with pellet for 110lb 9oz. Mac Campbell came second fishing meat for 110lb 5oz, then it was Les Bedford on 100lb 13oz, followed by Wendy Bedford on 68lb 5oz.